Conflicts in the Middle East, Africa and elsewhere are driving hundreds of thousands of refugees to seek shelter in neighboring countries, Europe and the United States. These crises are the most recent in a long line of conflicts forcing people from their homes. According to data from the State Department’s Refugee Processing Center, more than 3 million refugees in total have arrived in the U.S. since 1975. A look at where refugees to the U.S. have come from and their number provides a glimpse into global events and the U.S.’s role in providing a safe haven. 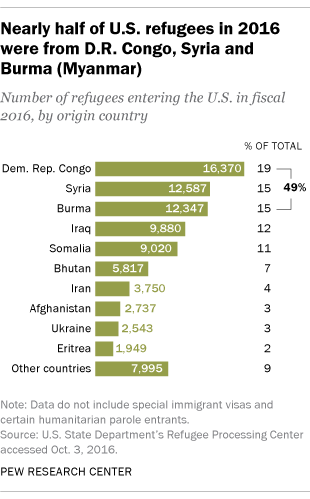 Of the 84,995 refugees admitted to the United States in fiscal year 2016, the largest numbers came from the Democratic Republic of Congo, Syria, Burma (Myanmar) and Iraq. Historically, waves of refugees to the U.S. have ebbed and flowed with global conflict. In the 1990s, waves of refugees came to the U.S. in large numbers from the former Soviet Union. However, refugee admittance dropped off steeply in the wake of the terrorist attacks in 2001. The total annual number of refugees has trended upward since then. The U.S. Code defines a refugee as any person outside of the U.S. that is of special humanitarian concern to the U.S. and “has a well-founded fear of persecution on account of race, religion, nationality, membership in a particular social group, or political opinion.” Refugees are different from asylum seekers, who meet the same definition but are already residing in the U.S. or pursuing admission at a port of entry (like the U.S.-Mexican border), according to the U.S. Citizenship and Immigration Services. 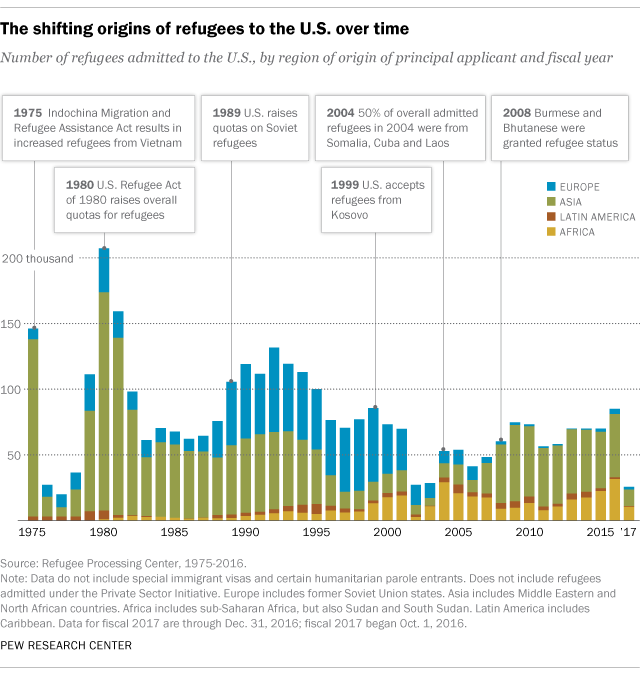 Modern waves of refugees arriving in the U.S. reached their peak in 1980 when President Jimmy Carter signed the U.S. Refugee Act. The law established the Office of Refugee Resettlement, raised overall refugee quotas and provided a provision to deal with special humanitarian concerns. This was largely in response to the massive waves of refugees coming to the U.S. in the 1970s from Vietnam and Cambodia. In fact, more than 200,000 immigrants, largely from Southeast Asia, were given refugee status by the U.S. the year the Refugee Act was signed into law. The 1990s saw a higher number of refugees from Europe – largely driven by those fleeing political turmoil in the former Soviet Union and the genocide in Kosovo. However, the past decade has marked a near-stop in the flow of European refugees to the U.S. – in fiscal 2016, only 5% of U.S. refugees came from Europe. In recent years, overall refugee volume is hovering at median levels historically. The number of refugees experienced a dramatic dip following the passing of the Patriot Act in 2001 – fewer than 30,000 refugees were let into the U.S. each year in 2002 and 2003, down 60% from the pre-9/11 level in 2001. But upticks in the number of refugees came in 2004 with a wave of Somali refugees, and in 2008 when thousands of Burmese and Bhutanese were granted refugee status. More recently, the ongoing conflict in Syria has displaced six-in-ten Syrians, or 12.5 million, from their homes, according to a Pew Research Center analysis of global refugee data. In fiscal 2016, the Obama administration resettled 12,587 Syrian refugees, more than 20% above the original target. Note: This is an update of a post originally written by Christopher Inkpen, a former advanced analytics intern at Pew Research Center, and Ruth Igielnik, and published on July 28, 2014.